On August 30, 1967, Thurgood Marshall becomes the first African American to be confirmed as a Supreme Court justice. He served in that position for 24 years before failing health forced his retirement. Marshall was appointed by president Lyndon B. Johnson and served into the presidency of George H.W. Bush. He was succeeded by another African-American, Clarence Thomas. "On August 29, 2005, Hurricane Katrina makes landfall near New Orleans"
On August 29, 2005, Hurricane Katrina makes landfall near New Orleans, Louisiana, as a Category 4 hurricane. The storm, which was the worst natural disaster in the United States wreaked havoc in Mississippi, Alabama and most notably Louisiana. The city of New Orleans was hardest hit by the damaging winds, heavy rain and storm surge. At one point, up to 80 percent of the city was underwater. The storm killed between 1,200 and 1,800 and caused an estimated $125 billion in damage across several states. "On August 28, 1963, civil rights leader Martin Luther King Jr. gives..."
On August 28, 1963, civil rights leader Martin Luther King Jr. gives his famous “I have a dream” speech on the National Mall in Washington, D.C. 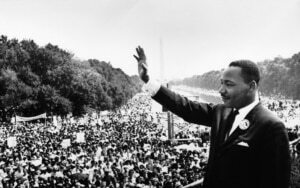 Speaking before more than 200,000 people from the steps of the Lincoln Memorial, King called for an end to racism and for the establishment of equal rights for African Americans. The speech was an inflection point for the civil rights movement and is considered one of the best American speeches of the 20th century.